When the human survivors of the last nuclear wars could leave their hideouts deep into the ground, they found the jungle, everywhere. However in a remote corner of the earth, there was a sanctuary, the Purple Hill. There lived a new race, the Boozooks, peace-loving and wise people. Thinking they were dealing with warriors, the humans savagely destroyed them during the Great Battle. Then, they built the City, a vertical structure where the poor lived in the bottom and the rich on the top. The City was self-sufficient thanks to the fields around it and the energy of the wind. The surviving Boozooks, exploited and oppressed, had to adapt to the situation and learn to live with the humans. At the head of the human government were the President and the Bigwig, his powerful adviser. The game starts at a time where the Bigwig burdens the city people with ever increasing taxes. There is also the Beast, a ferocious animal that snatches and kills people. They have a king and a council of Wisemen who live in a kind of temple around the king's court. Each of the Wisemen has a power defined by a sounding syllable. Combining these syllables produces magical powers. The Boozooks are a peaceful people because they succeeded in channeling the evil spirits and contain them in a sacred container, the Chprotznog, during arcane ceremonials. However, the latest Chprotznog has disappeared during the plundering of the Boozook residences by the humans. An endemic loss of memory ensued that afflicted the Wisemen and made them forget their syllables. The present king has no power. He has only one tooth left and drinks beer while watching the tobozon all day long. Nobody convenes the council, it doesn't seem to matter anymore. The City is made up of about forty screens, internal and external. They are arranged in groups of 3 to 5 screens perlevel and communicate in a ring-like fashion, so that you'll reenter at the far left screen if you exit the far-right screen and vice versa. Woodruff starts in the bottom of the city where the Boozooks live. The final confrontation takes place in the top, where the rich humans live. The screen is divided into 3 areas: the controls, the central area, and the command line. Move your cursor to the top of the screen to display the controls. Click on the file manager to save, load or quit the game. Click on the inventory to access your inventory. It can also be accessed by right-clicking anywhere on the screen. Click on the options to to turn sound on or off, or display the day and time. When you move the arrow cursor, you are exploring the screen. Text is displayed on the command line when you are in an active area of th screen. This allows to locate special objects or locations, characters to show or give them objects or to make them talk, or exits where the cursor changes into a door and the command line displays the destination. When you click the left mouse button on the ground, Woodruff will move to that location. When you click it on an active area, Woodruff will move to it and act upon it, for example to pick up an object and place it in his inventory. To retrieve an object from the inventory, click on the inventory icon in the control menu or right-click anywhere on the screen. A window with a symbol for each object is then displayed. Click the arrow cursor on the object of your choice and it will change to an object cursor (slashed arrow). The command line will display "USE [OBJECT NAME] ON" and you can click it on any active area on the screen to see if it triggers an action. To place the object back into the inventory, right-click with the mouse or click on the inventory control. - the accessories box: where woodruff keeps disguise items, such as the plastoc chin and tarred brush. - the paper box: where all documents are stored, such as the employment certificate and Rummy rules. - the powers bag: where Woodruff's discovered formulae such as the Memory Formula or Past formula are stored. - the Masters powers: where Woodruff's powers such as levitation are stored. There are 12 numbers in the Boozook system: KAH ZIG STO BLAZ DRU GOZ LRZ POO TBZ GNEE BNZ and GLAP. These are used in the 4-digit digicodes (primarily to open doors to the residences of the Wisemen) and tobozon numbers (phone numbers and TV channels). The Tobozon is a hybrid all-in-one TV-videophone-fax machine. Click on the Tobozon in the inventory to access it. A window displays a screen to the left, a boozook keypad to the right and a list of previously dialed numbers at the bottom (use the arrow button to scroll up or down the list). The slot below the window is used to fax documents (to the recruitment center). You can use the Tobozon to call people, to check the weather forecast, and to fax documents to the recruitment center. After a wile in the game, Woodruff will obtain a Transportozon. This device allows you to teleport to any place Woodruff has already visited. Simply click on the Transportozon in the inventory and a map screen will appear with all available locations. Click on the location you'd like to go to and you'll teleport there instantly. Note that Woodruff cannot use the transportozon when he stands in close-up. From time to time Woodruff will have need for a meteor shower, rain or wind to solve certain puzzles. To do so, check the weather channel on the Tobozon and pay attention to which location a certain weather event will take place. Go to that screen and use the weather watch to pinpoint where exactly on that screen the weather event will occur, and Woodruff will mark it with a cross. You can then interact with the cross to use the weather event. For example you can use a hat on the cross to catch rain water or use a kite on the cross to catch a gust of wind. During his quest, Woodruff has to recover the Boozook syllables and return them to their respective owners, the Boozook Wisemen. He instantly gets them when somebody pronounces them in the form of a sound. They are then automatically stored in the Syllables Bag in the inventory, represented as pictographs. To return a syllable to a Boozook Wiseman, use it as you would use any other inventory item. Syllables are also used to form formulae. Formulae are formed by combining various Syllables in the Create Formula form, which becomes available in inventory after Woodruff obtains the first Syllable. In the throne room, a parchment is found, containing a list of the various combinations of Syllables to create all formulae. Discovered formulae are stored, ready for use to solve puzzles, in the powers bag in inventory. After returning from the Great Battle in the past, the Master will appear to Woodruff, each time teaching Woodruff a new Master Power, such as nasal and hair control. These Master Powers are stored in the Master Powers bag in inventory. Ultimately Woodruff will only use the power of levitation, but he needs to find all other powers first before obtaining that one. The only denomination is the Strul. 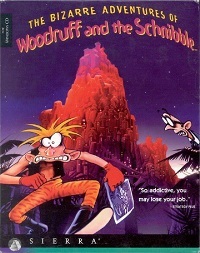 At the start of the game, Woodruff does not have any money. He is to retrieve one Strul and then make money by playing different money game. Woodruff will never spend his last Strul except on the Slot machine which always yields 4 Struls when inserting Woodruff's last one. That way he can never go broke.